Did you know that dogs have about 200 million scent receptors and that humans have only 50? Just a drop will do so that the scent is not overwhelming or toxic. Aromatherapy primarily works on the physical level with animals. The antibacterial, antiviral, anti-inflammatory, sedative or stimulating properties of certain essential oils have been proven to be very effective. Essential oils are most effective and have the greatest benefit with animals when applied topically with a carrier oil. This is because the oils are applied directly to the area in which they are needed. Here are a few tips for using essential oils when you have pets. Essential oil diffusers should be out of reach from your pets to avoid them being accidentally knocked over and the animal drinking the water and oils. Treat your pets the same way as you would small children, when it comes to diffusing. Less is best. Restrict diffusing to 1 or 2 drops only. Use EXTRA caution with the use of essential oils around cats. They do not possess the liver enzymes that humans do, which makes it very difficult for cats to metabolize essential oils and increasing the risk of toxicity. Make sure there is very good ventilation for your pets when you diffuse. This includes all of your small critters too. According to Pure Joy Naturals and their Certified Aromatherapists, Ingestion of essential oils is never an option for humans or animals. There is a lot of misinformation that is scaring people from using essential oils and their diffusers around their family pets. The general public has knowledge of the basic oils such as lavender, sweet orange, peppermint or lemon and generally use safe oils that would not be a concern when diffused. The most common scare has been about eucalyptus. As we wrote earlier, treat your pets as small children. The problem with eucalyptus is when people ingest or have their pets ingest this oil. When ingested eucalyptol, is an irritant to the gastrointestinal system, causing discomfort, vomiting, and diarrhea. Never ever ingest essential oils. Now it is time to relax and enjoy the soothing and calming benefits of a few drops of lavender. You and your pet can reap all of the benefits of top-quality essential oils without the worries. Good ventilation and a reduction of how many drops you use will ensure safe diffusing. We would be happy to answer any questions you have about essential oils and their uses. Tea tree is one of the most useful essential oils available. It is really interesting and important to know that what we call “Tea Tree” essential oil is more accurately known as “Melaleuca Alternifolia”, which is Latin. It’s called Tea Tree because historically the leaves were used to make medicinal tea. The essential oil come from steam distilling these leaves and extracting a very powerful camphorous oil. This concentrated Tea tree oil is toxic when taken by mouth but very useful when used topically with a carrier oil or by diffusing. There are actually over 290 different species of Melaleuca. The plants themselves range from a shrub to trees over 100 feet tall. They are diverse but all have common medicinal values. 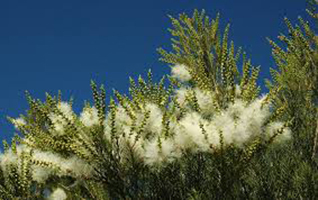 Melaleuca Alternifolia = Tea Tree Essential Oil – This is Australia’s go to oil for antibacterial and medicinal properties. It’s scent is quite camphorous and it is to be used with caution on the skin because of its strong antimicrobial properties. Here are some facts and uses for Tea Tree Essential Oil. Have an unsightly cold sore? Tea Tree oil calms the pain helps the sore heal faster. Mix tea tree oil with coconut oil and apply daily for best results. Tea Tree’s antimicrobial properties helps kill off parasites and fungi that cause foot odor and athlete’s foot. Dilute the oil in coconut carrier oil, and dab affected areas. Adding Tea Tree Essential Oil to a home diffuser can help eliminate spores, while spraying tea tree based cleaner on areas that often get moldy –shower door or curtain, washing machine and bathroom surfaces –will help you stay mold and mildew free. As it has very similar therapeutic effects and is gentler to the skin than tea tree oil, Niaouli oil is the best choice for those with sensitive skin. Niaouli essential oil’s disinfecting properties help your body fight infection while stimulating the components that help to heal the skin. It has a sweeter yet more antiseptic fragrance, and can be used in addition to or in place of Tea Tree, with less tendency to irritate the skin. Cajeput has some properties similar to those found in Eucalyptus (from the Eucalyptol) and Lemon (from the limonene). This is a great oil to use in place of or with Tea Tree or Eucalyptus. Cajeput contains higher concentrations of 1,8 Cineole (Eucalyptol), limonene and alpha-Terpineol. Tea tree oil contains more Terpinen-4-ol and gamma-Terpinene. As always, Safety first! The most effective way to use essential oils is by inhalation or topical use with a carrier oil. Never ever ingest essential oils as this is an unsafe practice that can lead to serious injury and organ damage.